Home » advertising » brands » marketing » Is multitasking and multi-screen attention taking away from a brand's reach? 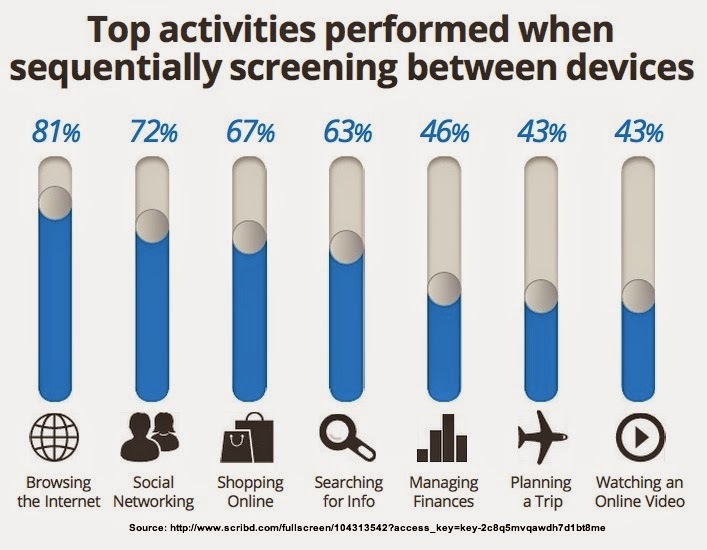 Is multitasking and multi-screen attention taking away from a brand's reach? Multi-screen or multi device marketing is a big buzzword. Screen journeying is another. But is this new consumer habit taking away valuable focus and attention to a brand's message? Writing in an article on 'single tasking' in Fast Company, Kevan Lee suggests that for the aware consumer single tasking is the key – being a result of slow-web and minimalism in combination. Because multi tasking takes away from productivity, from attention, from focus. And what does that do for consumers paying attention to brands and messaging? Havoc, I suspect. Lee write "A THREE-SECOND DISTRACTION LEADS TO DOUBLE THE MISTAKES! An Ohio State University study found that media multitasking--e.g., reading a book while watching TV--results in poor cognitive performance on both tasks; we keep doing both anyways because we get an emotional boost when we do. A group of business psychologists from Harvard, UNC, and HEC Paris found that spending time reflecting on a task leads to better performance and recall on subsequent tasks. University of Utah professor David Strayer confirmed that talking on the phone while driving a car (one of the most common forms of multitasking) is as dangerous as driving while intoxicated. Reaction and attention decrease such that drivers missed half the things they’d normally see, like billboards or pedestrians. Brands need to get both their creative and media plans in order again. Because while singletasking may be a consideration, it is against the norm. What is single-tasking? Well, it’s all there in the name. Single-tasking means doing one activity at a time with as few distractions and interruptions as possible.